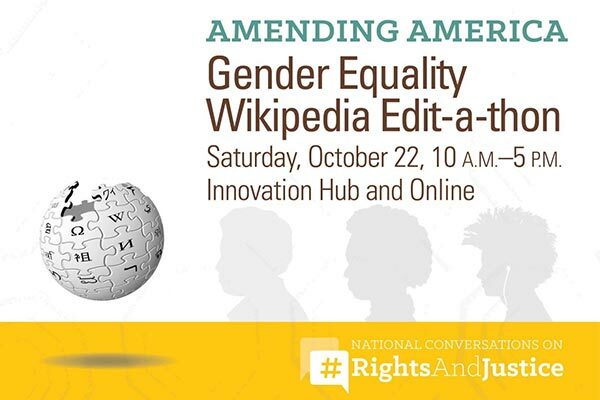 Come out and join us on Saturday, October 22, 2016 from 10:00 am – 5:00 pm for a Wikipedia Edit-a-thon on Gender Equality in the Innovation Hub at the National Archives Building in Washington, DC. Register for this event today! Help us improve Wikipedia entries related to gender equality with the National Archives and Records Administration. You do not need to have prior experience editing Wikipedia. During the event we will have an introduction to editing Wikipedia and a discussion of World War I Nurses and Red Cross records in the National Archives. It will be a lively discussion of women in the Historical record. This event is part of the Amending America Initiative at the National Archives in celebration of the 225th anniversary of the Bill of Rights. This event is also co-sponsored with Wikimedia DC and part of DCFemTech’s Tour De Code 2016 and in connection with our celebration of American Archives Month. Register and learn more about the event or email innovationhub@nara.gov if you have questions. No advanced technical skills required! All members of the public and NARA staff, whether Wikipedians or not, are welcome to join. The event will be held in the Innovation Hub at the National Archives in Washington, DC. To access NARA’s Innovation Hub, please use the National Archives Building’s entrance at Pennsylvania Avenue. This is the research/staff entrance, not the main exhibits/events door. A livestream option will also be available. Are you NYC based? Join our Gender Equality Edit-a-thon at the National Archives in NYC on Thursday, October 13, 2016 from 10 am to 2 pm. Learn more and register here. Join us online! Learn more and register here for the Virtual Gender Equality Edit-a-thon from October 14 – 21, 2016. This post was originally published on Narations, the blog of the U.S. National Archives.